The issue of Nissan 370Z’s running excessively high oil temperatures has been speculated upon since before the cars launch when photos of pre production vehicles fitted with racing style oil coolers started to appear on the internet. These oil coolers with bar and plate heat exchangers, race car AN fittings and braided steel lines were clearly not parts made with production intent. 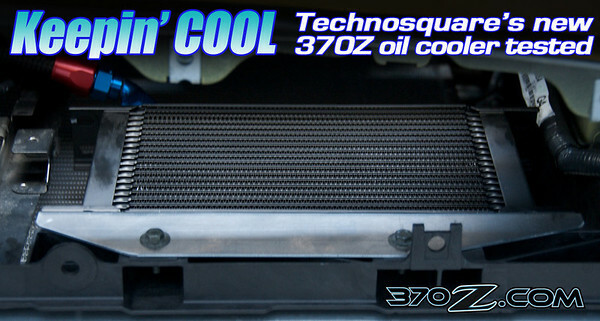 Why did the cars have these coolers, was the question echoed across the web. We figured that the coolers were just a precaution, installed on press fleet vehicles as cheap insurance against journalistic abuse or for durability in special arrive and drive promotional event use which can be more brutal than racing. Since we have actually started to work on and modify the 370Z we have come to realize that high oil temperatures have the potential to become a problem on these cars. We have recorded oil temperatures of 260 degrees plus on 370Z’s on the dyno, in brisk driving and simply in heavy traffic. Several times we had to stop dyno testing or slow down while driving to allow oil temperatures to drop. This is not race track flogging, a dyno run is a very short burst at wide open throttle through one gear, brisk driving is not an illegal balls out cannonball run, its driving a sports car how it was supposed to be driven and heavy traffic is something any car should be able to deal with easily. 260 degrees is the beginning of the danger zone or about as hot as can be tolerated by an engine without risk. At 260 degrees, oil breaks down rapidly losing its ability to lubricate and forming sludge. At this temperature the engines bearings which are made of soft malleable metal start to soften and lose there load bearing capacity. This is the point where damage can start if the car is driven to the limit. Can this be done @ the dealership? What's the approximate cost? A dealership probably will not install aftermarket parts excpet for Nismo S-Tune. It is pretty simple to install and any shop should be able to do it.